A reverse micellar system comprising CTAB/n-heptanol, developed for extracting lactoferrin (LF) from a synthetic solution of LF, was investigated for the selective extraction of LF from synthetic whey protein solution, which was prepared by mixing the pure whey proteins. The process conditions obtained during the process was further extended to extract the LF from real acidic whey. The selective extraction of LF was improved by studying the effect of NaCl concentration (additive) and aqueous phase pH on the partitioning of LF into the micellar phase. The highest extraction of LF (98.7%) from acidic whey to micellar phase was achieved at the aqueous phase pH of 10.3 and NaCl concentration of 1.1 M. The LF was back extracted to the aqueous stripping phase with 94% extraction efficiency and 100% purity. The recycling capacity of the organic phase after the back extraction of LF was analyzed to make the process more economical. 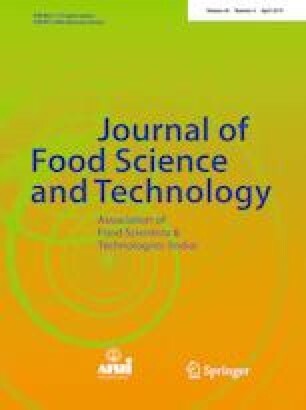 The authors are thankful for the financial support by the Science and Engineering Research Board (SERB), Ministry of Food Processing Industries (MOFPI), Govt. of India (Scheme number: SERB/MOFPI/0039/2013, dated 16/09/2013).